The euphoria following Friday’s JPM beat was tamed today with a revenue miss by GS. US markets dipped but recovered to end the day flat. The situation was better elsewhere with NKY and the European indices making small advances. USD advanced only very slightly (DXY +0.09%) mainly due to a CAD fade after the weak BoC Business Survey. Other currencies were largely flat, as were yields. Gold and Oil slipped slightly in line with the dollar. The pre-bell earnings were better today, with comfortable beats from heavyweights BAC, JNJ and UNH, although the latter immediately fell again, on concern about the Democrat plan (if elected in 2020) for universal healthcare. The overall effect on SPX, after an initial rally was another flat day, whilst once again non-US indices advanced. USD continued to gently fade up (DXY+0.13%), as EUR and GBP faded after mixed German sentiment (0900) and the UK claimant count miss (0830). AUD fell sharply on the dovish RBA minutes (0130), but caught a bid as the US awoke, and recovered equally fast. CAD was up, as was Oil after the API stock report beat at 2030. The surprise mover was Gold, dropping 0.9% to a new 2019 low, after reports that some ECB policymakers are pessimistic about economic projections, reducing the need for safe-haven bullion. Similarly, US yields were substantially up 6bp (bonds are also a safe haven). Despite early hopes from the Chinese GDP beat at 0200, the UNH rout spooked the markets today as the stock broke through April and Feb 18 support to an 18-month low dragging DJIA down, and pushing XLV into the red for 2019. This is despite NDX briefly (for 5 minutes at the open!) made a new ATH. NKY and FTSE followed suit (the latter into the next day), but DAX was immune to all this and carried on rising. Another quiet day for the dollar (DXY +0.06%) saw a small recovery in EUR balanced by move down in JPY. CAD briefly spiked up on the CPI beat at 1230, but quickly gave this up and also ended down. Gold continued to make new lows, and Oil gave up some of Tuesdays gains despite the EIA beat at 1430. Yields were flat on the day. 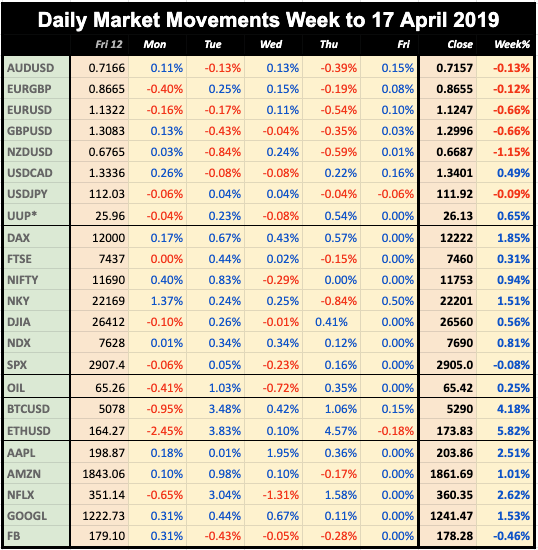 A strong beat on US Retail Sales at 1230, gave the OpEx day before the Easter break a boost and after stuttering early, markets US rose to recover some of Wednesday’s losses. Other world markets followed suit. In forex, EUR fell hard after the crucial German (0830) and Eurozone (0900) Manufacturing PMIs both missed, the single currency losing 0.54% in two spikes down. 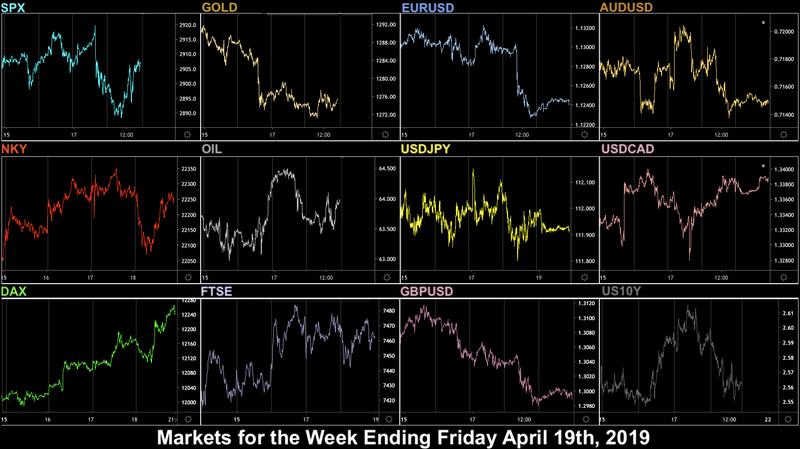 Most currencies (and Gold) also fell, giving DXY (+0.43%) its best day of the week. Surprisingly, yields fell again to return to Tuesday’s lows. 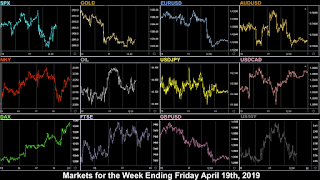 World equity and bond markets were closed for Good Friday. Forex was traded but was extremely muted, with a very slight dollar softening (except for CAD, which was down). Indices were fairly flat again this week, with DAX the best performer up 1.85%. The weakest forex pair week was NZDJPY down 1.24%. NFLX was the top FANG after its losses last week, and cryptos rallied again, but more modestly than they have done in the past. Note we use Google Finance data for daily movements, listing UUP as a proxy for DXY. All references to ‘the dollar’ are based on UUP. The equity and index prices are now based on the cash close each day. A quiet day on news. Markets are closed in Europe and Australia/New Zealand for Easter Monday. Before the bell we have volatile TWTR and three DJIA defensives KO, PG, and UTX, the latter comprising 7.4% of the index, but little in scheduled news. Markets are closed in Turkey. Before the bell, we have earnings from BA, CAT and V, adding up to 17.5% of DJIA, the largest concentration this season, whereas afterwards 16% of NDX reports in the form of FB, TSLA and MSFT. The main scheduled event is the Canadian rate decision, or more specifically, the statement. Only one DJIA stock, MMM (5.9% weight) reports before the bell. The action is at the end of the day with giants AMZN and INTC, which with SBUX make up 14% of NDX. It’s odd that SBUX is in the ‘Tech’ 100, but so is inter alia PEP, WBA, and KHC. There are rate decisions on TRY, IDR and UAH. Markets are closed in Australia/New Zealand for ANZAC Day, and also in Portugal and Italy. The preliminary GDP and PCE reports for Q1 are clearly the most important release today. Oil giants XOM and CVX report before the bell. There are rate decisions on RUB, SGD and COP. Markets are closed in Romania. This week I was involved the preparation of a video for my colleague Ed Matts forthcoming webinar next Thursday. You can see it here and sign up for the presentation here.